Good Morning and Happy Thursday! It's early morning here in CNY, we're beginning to warm up a bit since the last time we "talked". And yes, my voice is beginning to improve. Still a bit raspy but I'm able get the words out. Forward progress right? Anyhoo, I have another card using Brusho today. I've had fun this week playing with it. 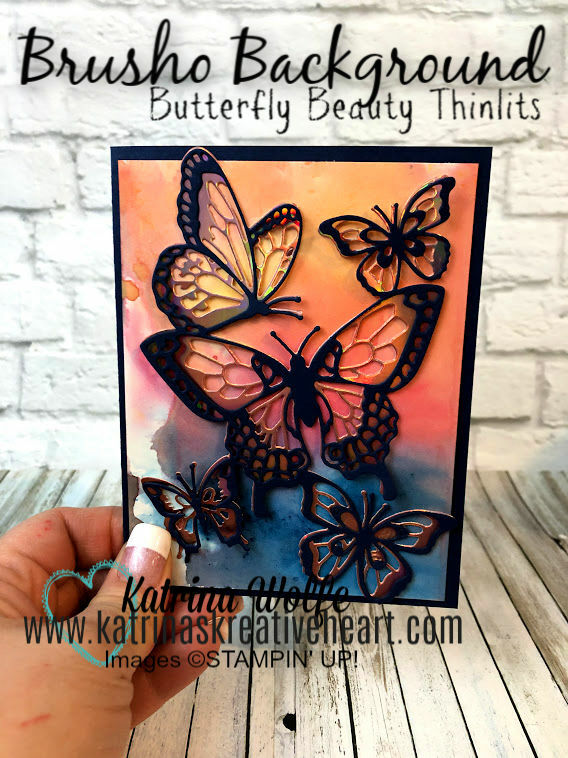 In this card, I used the "smooshing" technique where I sprinkled the color crystals onto my craft mat then spritzed them with water creating little puddles of color. I then took my Shimmery White cardstock and "smooshed" it into the ink. Once I was happy with the coverage, I used my heat tool to dry the ink so that I could adhere it to the front of my Night of Navy card base. I then ran a piece of the Sale-a-bration Grapefruit Grove through the Big Shot with the Butterfly thinlit and a piece of Night of Navy with the other. I then layered the 2 butterfly pieces together using a little Snail adhesive then adhered them to the card front. This really was a quick and simple card to make and I truly enjoyed playing with my Brusho.